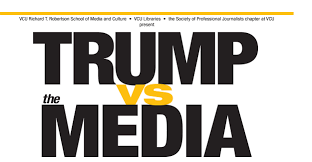 President Donald Trump has referred to the press as the “enemy” and is constantly on the attack when it comes to the “mainstream media.” Now, Virginia Commonwealth University in Richmond, will be hosting a talk on the relationship between Trump’s administration and reporters. Bill Oglesby is a journalism professor at VCU. And while he doesn’t agree with how President Trump attacks the media, he also doesn’t mind some of the effects. His students, now more than ever, are thinking critically about the relationship between government and the press. “In that sense we might owe a debt of gratitude to the president because he’s bringing up issues that probably ought to be brought up in one way or another,” says Oglesby. For the future reporters he teaches, those are questions like: What is my role? Is an adversarial relationship between reporters and government officials a bad thing? “Because frankly, sometimes the problem’s been the opposite where the media and the government get too close,” he says. Wyatt will be speaking at VCU Thursday evening. The event is being put on by the Roberson School of Media and Culture. It's free and open to the public.